Eliezer is the narrator of Night and is, in essence, a pseudo-persona of the book’s author, Elie Wiesel. Night follows Eliezer’s psychosomatic and troubling journey, as the Holocaust steals his humanity, robbing him of his faith in God and takes him deep into the pits of despair. Despite many experiences that would cause even the strongest man to abandon his fellow kin, Eliezer maintains a strong bond to his father. It should be noted that the audience is only made privy to Eliezer’s surname in passing and that it is never again said. Eliezer’s story, similar to the life experiences of Wiesel, is powerful and intimate. However, it also speaks to the pain endured by hundreds of thousands of Jewish teenagers at the time. Eliezer is the protagonist of Night. However, he is much more than a typical protagonist. He narrates his experiences in a highly idiosyncratic, first-person and auto bibliographical manner. The result of this is an intimate and highly personal depiction of the life as a Jew during the Holocaust. Unlike man other books written about the Holocaust, Night does not use a generalized historical perspective to demonstrate life during that time period. Instead, Eliezer’s narrative, while limited in range, speaks volumes by sharing with the audience a personal viewpoint and a detailed description of life as a Nazi captive. 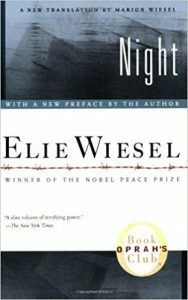 It is essential to differentiate between Elie Wiesel, the author of Night, and Eliezer, the book’s protagonist and narrator. Some question whether Night really is a book of fiction. The experiences had by Eliezer are hauntingly identical to those of Wiesel during the Holocaust. However, it is important to note that minor details have been altered – Wiesel wounded his knee, for example, whereas Eliezer wounded his foot. Not surprisingly, it is extremely difficult for Holocaust survivors to recount their experiences. By creating a narrator (Eliezer) Wiesel is able to distance himself for the trauma he endured. Night was not written with the specific purpose of documenting history or its truths. Instead it focuses on the emotional truth felt by those who experienced the Holocaust. Eliezer’s faith in God and humanity is tested frequently throughout his ordeal. He comes out intensely changed. Despite being the only other character, with the exception of Eliezer, who is consistently present throughout the book, his name is used only once – upon the conclusion of the memoir. Shlomo is Eliezer’s father and a respected member of the Jewish community in their homeland of Sighet. His son shares this admiration and sees his father as a driving force for his own survival of the concentration camps. Despite Eliezer’s continual character changes throughout the book, his father remains reasonably inert. He is an older man, with a deep love for his son. As the memoir progresses it becomes increasingly obvious how much the man relies on his son for support. The audience never hears the father’s thoughts or depictions of his own experiences, and are really only made privy to the man’s decline. The same decline that all other concentration camp prisoners experience. The continued lack of awareness into the father is reflective of Night’s commitment to following the perspective of Eliezer. The audience sees the father only through the eyes of his son. Devoted to his father, Eliezer never stops thinking of him, and their relationship is paramount of Eliezer’s survival. The father is a formative aspect of the life of Eliezer. The father is always present in t he memoir because of how important his is to his son. He is a driving force in Eliezer’s will to survive. His father is his anchor to humanity and goodness of heart. It is memories of his father that remind him that life exists outside of the Holocaust. Moshe is Eliezer’s teacher of Jewish knowledge. A poor but noble man, Moshe is deported from Sighet ahead of the rest of the townspeople. He manages to escape and returns to warn the town of the Nazis intentions. Unfortunately, the townsfolk assume he has gone mad and refuse to heed his warnings. Moshe is the very first character introduced in Night. And, despite only being present for the first few pages, his values resonate throughout the entire memoir. Moshe is representative of the commitment to Judaism and Jewish mysticism. He was Eliezer’s Cabbala teacher, and could often be heard speaking of the mysteries of the universe and the place of God in the quest of acceptance and understanding. Mosh is quoted as saying “I pray the God within me that He will give me the strength to ask Him the right questions.” This is depictive of to key components in Eliezer’s struggle: The notion that faith is based on questions and the belief that God is all around us. It can be said that Moshe is also a branch out of Wiesel’s personality. His mere being arouses an overarching purpose of the entire memoire. It has been previously suggested that Night can be interpreted as an attack against keeping quiet. Throughout the book, evil is prolonged by silence and a lack of resistance – as evident in the townspeople ignoring Moshe’s warnings. Moshe, like the author himself, bore witness to tremendous misfortune and used his experiences to warn others in hopes of preventing a similar evil from ever occurring again. Akiba is a victim of the Jewish Holocaust who, over time, begins to lose faith in his God because of the experiences he has had, and the things he has witnessed, in the concentration camp. Madame Schachter and Eliezer are deported from Sighet in the same cattle car. Every evening she cries and screams that she can see blazing furnaces in the distance. The other passengers believe that she has gone crazy with fear. However, she soon proves to correct as the train pulls into the crematoria in Auschwitz. Juliek meets Eliezer in Auschwitz, and again when he can be heard playing the violin as the Jews march to their death in Gleiwitz. A band of brothers who befriend Eliezer in Buna. Fellow Zionists, the cohort with Eliezer to move to Palestine after the end of the war. Upon his arrival to Auschwitz, Eliezer crosses paths with the ill-famed Dr. Mengele. Josef was the inexcusable monster who tortured the prisoners and later earned the moniker the “Angel of Death” for his part in sentencing countless prisoners to death in the gas chamber. He also had a fondness for conducting experiments on unwilling human subjects. Idek was known as a Kapo. He was a prisoner who had been selected by the Nazis to keep control over the other prisoners. While in the electrical warehouse in Buna, Idek was assigned to Eliezer. Despite having to endure the same ill fate as the rest of the Jews, the Kapo were notorious for being just as cruel and evil as the Nazis. On occasion, Idek violently beat Eliezer. Franek was the foreman of the plant the Eliezer was assigned to work at in Buna. Upon noticing a gold tooth in Eliezer’s mouth, Franek instructed the camp dentist to tear it out with a spoon. A devout Jew, the Rabbi is abandoned by his own son. This is only one of several mentions of sons behaving with indignity towards their fathers in Night. Eliezer vows to never act in a similar manner towards his own father. Zalman is a prisoner. During the march to Gleiwitz, he is trampled to death. Meir Katz is a friend of Elizer’s father, from Buna. While enroute to Buchenwalk, Meir saves Eliezer’s life. A relative of Eliezer. Eliezer lies to Stein, in an attempt to keep his hopes up, by telling him that his family is still alive and well. Hilda is Eliezer’s oldest sister. Bea is Eliezer’s middle sister. Tzipora is Eliezer’s youngest sister.